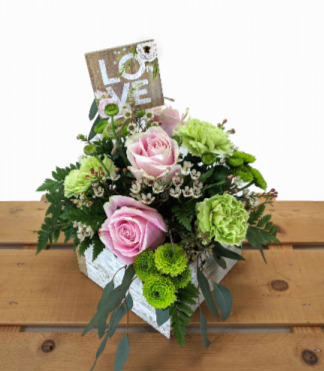 An arrangement of pastel pink roses and dusty lime green carnations, and with a pop of bright green mums in a whitewashed antique style wood box. 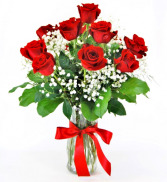 Traditional red roses symbolize love and is a wonderful way to express your love. 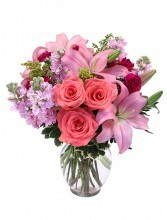 Shown is a dozen red roses with babies breathe for an accent. 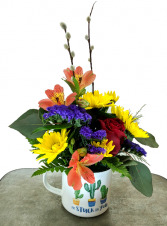 You are "stuck" on your loved one and show them with this beautiful combo of peachy alstromeria, purple full statice, yellow daisies, and a red rose. Give them sips of love long after Valentine's Day when they use this ceramic mug!